Creating a unique backdrop for your layout is a great way to emphasise a special photo and give personality to your albums. The following layout uses the outline of a butterfly in the background to focus the viewer's attention on the beauty within the photo. The same design could be adapted to numerous themes such as little girls, friends, sisters, wedding and more. This layout was created using two papers from the Deja Views Pink/Org Paper Collection (Flowers Pink/Org Paper and Dots & Squares Pink/Org Paper), bright pink Bazzil cardstock, yellow Bazzil cardstock, yellow cardstock, light pink ink, dark pink ink and a pink pen. Print out butterfly template. Mirror the template and print out again. Join the two templates together for the complete butterfly. Cut out the large butterfly shape from Flowers Pink/Org Paper. Keep in mind that the top right corner of the butterfly will not fit on your page so you will need to create a corner. Once it is cut, adhere to your background bright pink Bazzil cardstock, as shown in the layout above. 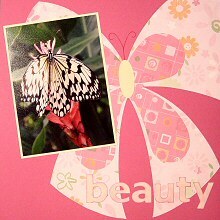 Cut out the small butterfly shapes from Dots & Squares Pink/Org Paper and adhere to your butterfly. Cut an ellipse shape from yellow cardstock and glue down to form the body of your butterfly. Use a pink pen to embellish your butterfly. Draw in some antennae. You might like to give your butterfly a dot border. If you are comfortable with doodling, you may also like to add some other doodles for extra effect. Mat your photo with yellow cardstock and adhere on an angle in the top left corner of your page. Create your title whatever way you want and place in the bottom right corner of your page. This title was cut from yellow Bazzil cardstock. It was then covered in light pink ink and allowed to dry. Once dry, dark ink was used around the edges and then lightly brushed over the entire letter to give depth.